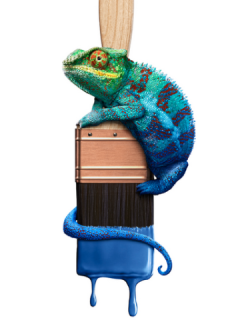 You’re probably familiar with the two animated chameleons who’ve been actively selling Valspar Paint for the last couple of years in TV commercials. You know . . . those two lizard-like creatures who are able to camouflage the color of their body to blend into their surroundings. Named Jon and Val (short for Valspar) - it appears the male doesn’t quite have the same eye for nuance that Val has. But both are color enthusiasts as they discuss which hue is the just right shade for their home. It’s a creative commercial that appeals to the customer’s pocketbook as well as well as their love for vibrant colors (Note: If the buyer isn't satisfied with the color they select, they are entitled to return for another color, free of charge). 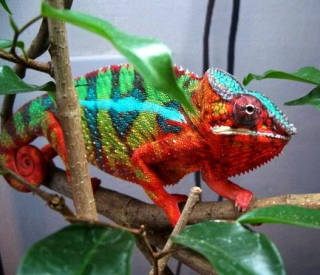 But how do those real-life chameleons change colors and do it so quickly? Reporting in Nature Communications, researchers say that instead of relying on pigments, these reptiles are born with nanocrystals called iridophores which exists under the skin and contract or expand to essentially reflect different levels of light. In this study, the researchers observed the male panther chameleon of Madagascar—which isn't easy to find, given how skilled they are at shade shifting. "I assure you ~ in Madagascar, they are really difficult to spot," researcher and author Michel Milinkovitch, a biophysicist at the University of Geneva told the Los Angeles Times. 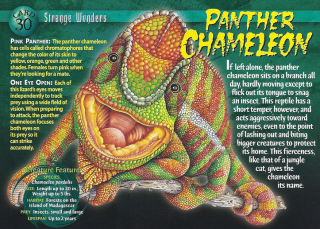 By filming color changes and examining the chameleons' skin using transmission electron microscopy, the scientists were able to view two layers of skin with iridophores. As it turns out, the tiny guanine nanocrystals boast very specific spacing between each crystal that in turn reflects different layers of light—shorter spacing reflects blue light, longer spacing red. By interacting with yellow pigment cells (xanthophores) in the skin, greens and oranges emerge. What's more, some less-organized crystal spacing may even reflect near-infrared light, helping to cool the chameleons. Now Jon & Val, they're another story. . . So now that we know how they change color in nature, how do those animated chameleons change color in their those TV commercials? Somewhat similar to the intricacies of the biological DNA of their make-up in real life, the technology that goes into producing them on film is exceedingly intricate as well. From the live action shoot, where two life size 3D printed models were used as stand-ins, to CG manipulation, the Mill Production team worked diligently to make these characters come to life as full-blown CGI actors, while applying different colors every few seconds or so, to match the changing wall colors. The Jungle Book Is Coming Soon! The Animal Video Of The Day!!! Homicidal Turkey, Anyone? The Animal Video Of The Day!!! Dog Versus Leaf Blower! The Windy Animal Video of the Day!! !